April 19, 2018 8 p.m.
April 29, 2018 at 2 p.m.
$15 general admission, $12 for Cal Poly Pomona alumni and $10 for all students, Cal Poly Pomona staff and faculty, as well as senior citizens. Set in Los Angeles during the late 1980s, "Real Women Have Curves" follows Ana, who hopes she will one day get to attend college. For right now, however, she’s working in a small East Los Angeles sewing factory as the youngest in a group of five Latina women. As the group endeavors to meet impossible deadlines looming on the horizon, they discuss their lives, loves and deepest desires. Told from Ana’s point of view, the play tackles issues surrounding gender politics and the Latina immigrant experience. Directing this show is B. J. Dodge, who taught at the California Institute of the Arts for 27 years, primarily in a community arts partnership with Plaza de la Raza in Lincoln Heights. During that time, she cultivated an affinity for Latinx cultures by seeing and experiencing parents who sacrificed so much for their children to learn and participate in theatre. "What it’s given me is a real appreciation for the parents of these children," Dodge said. "Not all of them were supportive and just thought of it as a hobby, but when they show up and see the play, that’s a moment when they understand that their child is telling them a story from the stage. And it’s beautiful." 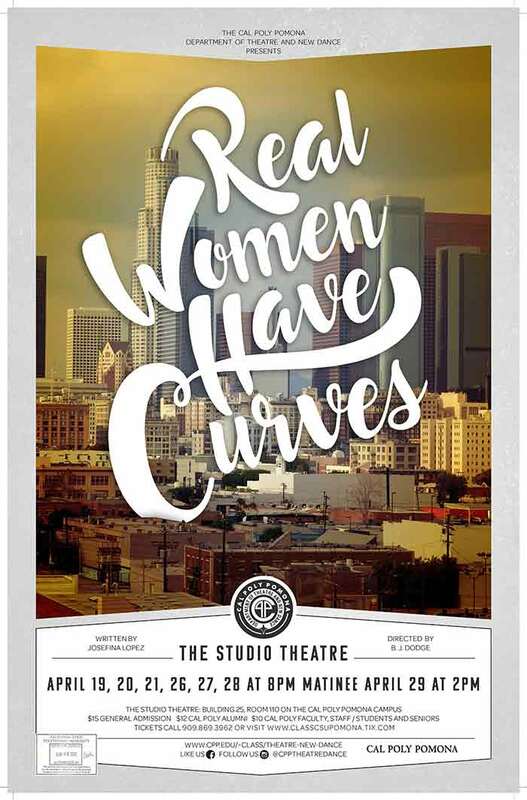 "Real Women Have Curves" plays at 8 p.m. on April 19, 20, 21, 26, 27 and 28, and at 2 p.m. on April 29. Tickets are $15 general admission, $12 for Cal Poly Pomona alumni and $10 for all students, Cal Poly Pomona staff and faculty, as well as senior citizens. For more information and tickets, visit www.bit.ly/cpptndtix or www.classcsupomona.tix.com.